TRUTH MATTERS » Blog Archive » Was Paleontologist Richard Leakey Biased? Was Paleontologist Richard Leakey Biased? “Dr. 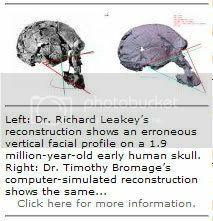 [Richard] Leakey produced a biased reconstruction based on erroneous preconceived expectations of early human appearance that violated principles of craniofacial development,” said Dr. Bromage, whose reconstruction, by contrast, shows a sharply protruding jaw and a brain less than half the size of a modern human”s. Click HERE to read the rest of the article. Click HERE for Science Daily article on this and HERE for the presentation details. This is the same skull which was found in strata originally dated at over 200 million years, but the date was explained away as “excess argon” and redated. Hmmm … Why was it redated? Was it because of the fossils that were found there? Click HERE and HERE for some good creationist articles on this topic. So really, now that the dust has settled, what Richard Leakey found was probably an extinct ape … nothing more. Think of how much effort and expense was expended researching this supposed human ancestor! The truth is, the pre-Darwinian view of nature–a Creationist view–fits the data that science continues to uncover much better than today’s evolutionary paradigm. This entry was posted on Wednesday, August 1st, 2007 at 6:25 am and is filed under Creation/Evolution. You can follow any responses to this entry through the RSS 2.0 feed. You can leave a response, or trackback from your own site. ‘Modern man’s earliest known close ancestor was significantly more apelike than previously believed, a New York University College of Dentistry professor has found.